A favorite Ghanaian food is called “Light Soup” It is a salty broth with some vegetables and fish, chicken or cubes of beef. It can be eaten with a variety of staple foods including fufu or boiled yam. I was eating a meal at a conference in Ghana. Light soup was being served as one of the dishes in a buffet. One of the guests from outside the country had served himself some light soup. In it, he had managed to get a piece of tripe which he was inspecting. One of the Ghanaians told him that he had acquired the most sought-after morsel. At the table was a sharply-dressed, educated young Ghanaian lady who chimed into the conversation. She said that while serving herself the light soup in the buffet line, she had spent a moment searching for a piece of tripe, but without success. She sounded quite disappointed. What people like to eat is a function of their culture, especially what they ate as a child. It is not, as some might presume, a function of their education or sophistication. By the way, I have yet to eat tripe in light soup. If you liked this, you might also like Advice on Taxi Windows, No Hard Knocks, Festooned with Signs. 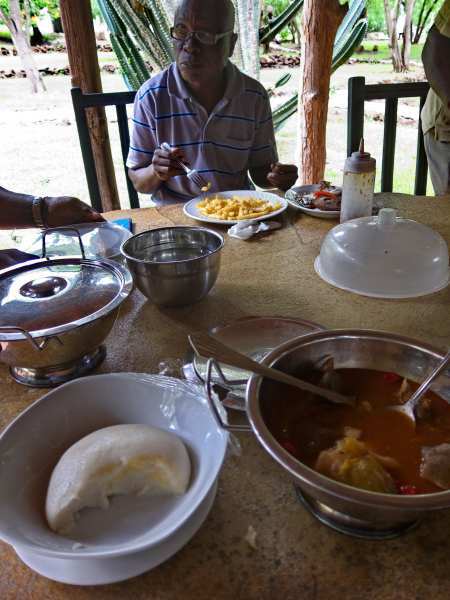 This entry was posted in Culture, Ghana and tagged ghana food, Ghanaian food, light soup, tripe. Bookmark the permalink.